2" x 72" S/C Sanding Belt 60 Grit, 2 pk. 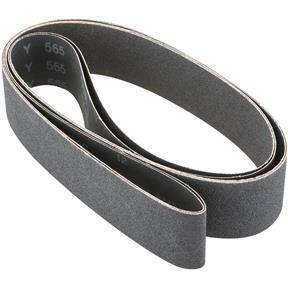 Woodstock - 2" x 72" S/C Sanding Belt 60 Grit, 2 pk. these are not the expensive belts but they are a good value for the money. The sales people were fantastic!! They were very informative about what I needed and made the ordering process so easy!!! This is a good basic grinder. I have ground knives on this type of grinder previously, so I knew what to expect when ordering it. 1.The lowest cost 2x72 grinder on the market, that is not a kit. 2.Assembly is fairly straight forward. I started putting it together on Sunday evening and my 13 year old son finished assembling it while I was at work Monday. 3.With a 1 horse power motor, there is plenty of power for most jobs. A huge increase over the 1 inch belt grinder I had been using previously. 4.It runs on 110 volts. So, you can plug it in anywhere you like. 5.With the belt set up vertically, as pictured, the machine takes up very little shop space. A fraction of the space many of the tree wheel grinders take up. Mine sits on top of a rolling tool chest, so I can roll it out onto the driveway on nice days. 1.There is only one speed and it is fast. It takes some getting used to, but You can grind a knife at that speed. A variable speed drive option would be a great improvement. 2.Belt tracking is not great, but not terrible either. That is to be expected from a two wheel belt grinder. 3.The tool rest could use some improvement. The parts are stout, but the overall design poor. If you work freehand this is not a problem. Otherwise, you will need to build/purchase yourself a better tool rest. The existing tool rest works well as a mounting point for a dust collector. Overall, this is a good grinder and I would recommend it to friends. It is ideal for someone starting out as a knife maker or who needs a grinder for the home shop or garage. It is not a production machine, but for the hobbyist or artist it will do just fine. With the rite belts, it works great on wood, plastic or whatever. Good belt provides good longevity. I wish they were sold in bulk discounts.